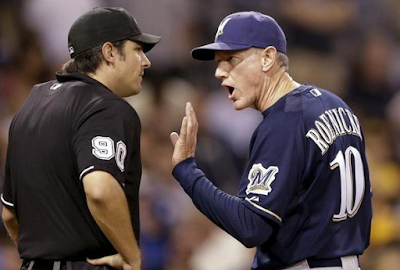 "Sax hates Roenicke" is my favorite thing right now. Is my spelling of "measley" correct? But no, you didn't spell measly correctly. That's what happens when you and your brother cheat during the home run contest. Did A.J. Ellis Hit a 3-Run HR? Puig with a two-run shot! Dodgers extend their league-leading HR bonanza! I love this Holberg kid. He's my kind of opposing pitcher! Wow, we got out of it. Nicasio finagles a K, and Avilan follows with a K of his own. Reds strand two. OMG!!!! How much do they expect us to take???????? KJ walks Bourgeois. Tying run at the plate. PGT UP! AND TIMELY THIS TIME!